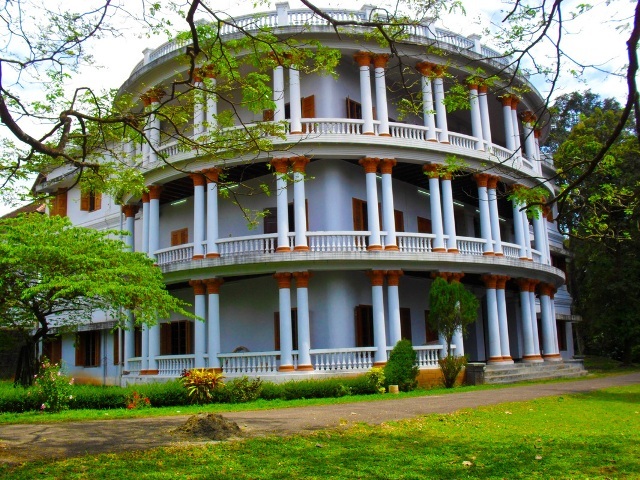 The Thripunithura Hill Palace, which now serves as a museum, is Kerala’s largest archeological museum. It used to be the official residence of the royal family in Kochi. The palace, which is located at about 12 km off the city of Kochi, was built in 1865. The palace has a total of 49 buildings that is enclosed by 52 acres of land, lawns, ponds and fountains. The architectural design of the palace follows the traditional Kerala style. Apart from the museum, the compound also houses a deer park, children’s park, heritage museum and a pre-historic park. The place is a home to a variety of rare medicinal plant species as well. The palace is currently being officiated by the Kerala State Archeology Department. They have opened the museum for visitors every day except on Mondays. You can visit the palace from 9 AM to 5 PM. Visitors can approach the palace by rail or by road. It will take about 20 minutes ride from Ernakulum if you ride by car, and about 15 minutes via train. For visitors coming from foreign countries, the palace is about 30 km from the Cochin International Airport. In 1980, the Cochin Royal Family handed the palace over Kerala’s government. After that, it was taken over to the state’s Department of Archeology and it was converted into a museum. The public viewing began in 1986. Since then, the palace has become a very popular museum in India and is also a favorite shooting location for the Malayalam Film Industry. The museum exhibits 14 different displays, which include ornaments and crowns of the royal family of Cochin, marbles, weapons, sculptures, coins, inscriptions, and many more. Most of the main attractions in the palace museum are belongings of the Cochin Royal Family. There are also exhibits that are from the Paliam Devaswom, Travancore Royal House and items that came from the Department of Archeology. The museum also displays more than 200 antique pottery pieces, ceramic vases from China and Japan, tomb stones, hood stones, granite, menhirs, laterite memorials, models of wooden temples, rock Stone Age weapons, cast models, and many more. Of course, the artifacts and old Royal Family belongings are the main attractions in the museum, and the building itself. It is both a fun and educational place to visit with your family during your stay in Kochi. The Hill Palace is one of the gems of the city and is a must for all visitors. It will show what lifestyle and culture the Royal Family might have during their stay in the palace. Taking a trip to the Hill Palace will let you get a glimpse of what the Royal Family of Cochin was like during their reigning period. Entering their old residence will definitely be an amazing experience. You don’t just get a chance of entering a royal residence like that, but you can when you visit this incredible palace in Kochi, which is now one of the most treasured museums in India.